Everyone loves being at the top. Head of the school, head of a team, head of a league, face it, everyone loves being the head of anything. However, no one enjoys going from the top to the bottom. For one group of students, the eighth graders of middle school, it happens every year. The eighth graders run the middle school, but once they graduate, they start back at the bottom. They go from a school with twelve year olds to one whose older students are legal adults, not an easy transition for anyone. Some adapt better than others, but most are just nervous freshmen, being the little fish in the school. Finding their way at the bottom of the school won’t be easy. With the endless freshman chants, the seniors who tower over them, and the speedball games that students treat like the World Series, the freshmen will surely become acclimated to the school, one way or another. A historical architect, an investment banker and an educator were guests of honor on Wednesday June 4 at the Emerald Hall in Abington as Rockland High School inducted three alumni into its Academic Hall of Fame. The ceremony took place before the Underclassmen Academic Awards ceremony. The latest inductees join a group of RHS Hall of Famers that includes authors, artists, doctors, lawyers, teachers and an astronaut. Assistant Principal Susan Patton introduced the three inductees, Marsha Fader ‘68, Wayne Owen ‘74 and Fredrick Damon ‘82, who each spoke about their days at Rockland High, their accomplishments after high school, and the influence Rockland has had in their lives. 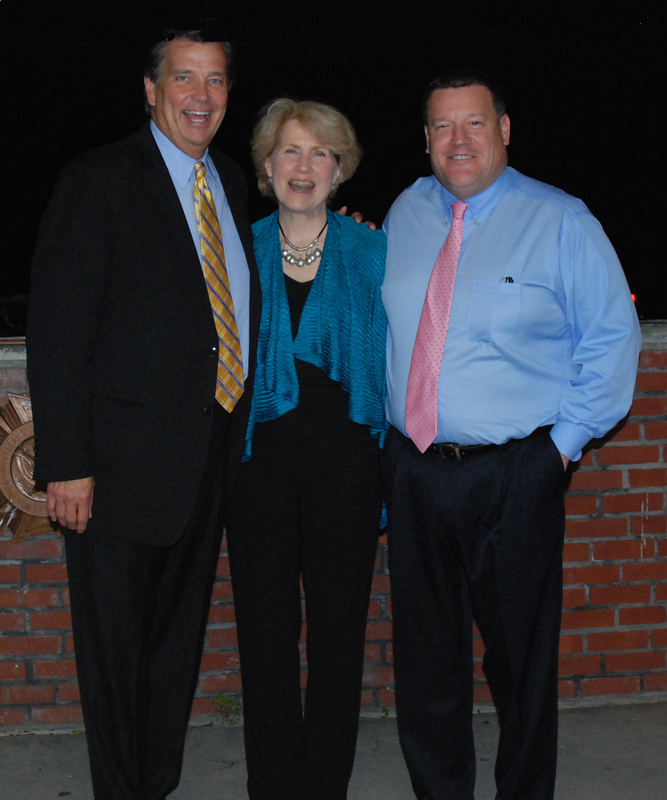 Inducted into the RHS Academic Hall of Fame on June 4 were left to right, Wayne Owen, Marsha Fader and Fredrick Damon. Marsha Fader who graduated from Rockland High School in 1968 was an outstanding student and very active in school activities. After graduating she attended Simmons College where she earned a degree in American Studies. Afterwards she attended Columbia University and received her Masters degree in Historic Preservation. She also received a Masters of Architecture degree from the Frank Lloyd Wright School of Architecture. Fader said she has traveled all over the world designing, restoring and preserving historic buildings including the Deng Nan-Guang Museum Park in Taiwan, the Turquoise Trail Art Center in Santa Fe, New Mexico and the 1746 Old Windmill in Nantucket. Fader now lives in Nantucket where you will see many examples of her work. She credits her days in Rockland with giving her a strong sense of community and family. She said that her mother and father both owned businesses on Union St. for many years and that she developed her love for older buildings and architecture growing up among the many historic buildings on Union Street. Wayne Owen, a 1974 graduate, is one of five Owen siblings who have graduated from RHS. Owen was a member of the National Honor Society and captain of all three sports he played. Owen attended Babson College and had a double major in Accounting and Quantitative Methods. After college he worked at State Street Bank for 12 years. In 1990 he and three other college classmates launched an investment firm which now manages 35 billion dollars in assets. Owen is married and has three children. Owen credits his family and the schools and community of Rockland for the perseverance that led to his successes in life. He said that to become a part of such a group of alumni is more than he would have imagined and he told students in attendance to take advantage of all the opportunities that Rockland and its schools provide for them. Owen also said that the great tradition of sports in Rockland was very important to him. He mentioned former principals and coaches at RHS, A. Scott Mackinlay and Steve Sangster, as mentors. Owen was also part of the ‘72 State Championship Basketball Team. Fredrick Damon, as RHS students know, is a respected math teacher and dean at Rockland High School. He is also the head coach of the boys basketball team and an assistant football coach. During his senior year as a student at RHS he was a starter on the basketball team and captain of the football team. In 1982 he graduated fourth in his class and went on to attend Boston College. When he graduated from BC in 1988 he received a degree in mathematics and a minor in computer science. He is married with five children. Damon said he had not intended to be a teacher but started “quite by accident” in 1990, teaching for five years in the Rogers Middle School. According to Patton, Damon “has a way with reluctant learners.” Damon said he enjoys being able to affect his students’ lives in the ways a teacher and coach can. In his acceptance speech he read several letters from former students who thanked him for the help and guidance they received from him. In his speech,Damon also recognized his mother, Fran Damon, who is retiring this year as a secretary in the Rogers Middle School. Mrs. Damon has worked for the Rockland Schools for over 30 years! 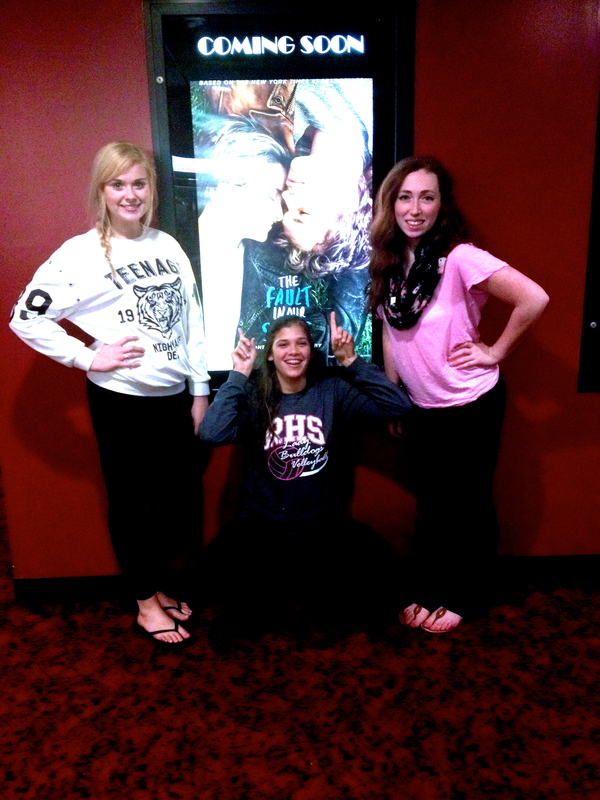 Meghan Foster, Sam Demarco, and Ashley Pezzella attend a screening of Fault in Our Stars on June 5. Many media outlets are calling it the most anticipated movie of the summer. The Fault in Our Stars was released on June 6. Prior to its actual release date, some theaters had screenings as early as 9 p.m on June 5. With girls lined up several hours before doors opened, the movie sold out in many locations. The main characters were played by Shailene Woodley as Hazel Grace and Ansel Elgort as Augustus Waters. This tragic comedy of star crossed lovers, both battling cancer, takes the viewer on a journey through their everyday struggles and places the viewer in the midst of the world as they see it, and their desire to meet an author who inspired them both. Throughout this journey, Hazel Grace and Augustus Waters are able to travel to see their favorite author who turns out not to be what was expected. As the movie progresses, the relationship between Hazel and Augustus grows into something even cancer cannot destroy. Despite many rumors, John Green, author of the novel upon which the film is based, did not write the screenplay for the film. Although he did not write it, many of the lines were similar, if not the same to those in the book. Though it did not conform to the novel exactly, and was missing many minor details that helped the plot develop, the cinematography and relationships built amongst the characters was strong on screen. The movie did not do the book justice, and lack of key point got some fans upset. Overall, The Fault in Our Stars is a definate must see for those who have read, or who have never read the book. From the Homecoming Dance in the fall, to Junior and Senior Proms this spring, alcohol and abuse of school rules regarding drinking have been an ongoing issue at Rockland High this year. Students have been discussing the situation, and many rumors with varying degrees of truth have been spreading around the school. Principal Dr. Alan Cron recently sat down with the staff of The Veritas to discuss what happened this year and plans for future dances and school events. The problems began in October, when two students were caught drinking at the Homecoming Dance and suspended from school and extracurricular activities. The winter dance, usually hosted by the Student Government Council, was cancelled due to poor ticket sales, which some students relate back to the fear of breathalyzers due to the problems at Homecoming. The ongoing discussions had calmed down by the Junior Prom on May 15 at Indian Pond Country Club, but more problems arose when three students were sent home and suspended from school for drinking. In addition, the school was notified several days later that there was considerable damage done to the plumbing systems at the venue due to students flushing small plastic liquor bottles down the toilets. “The school has to pay. We become your parent in a way, and have to take responsibility. It’s not our fault but it’s our problem,” he added. He also says it is virtually impossible to find the people actually responsible for flushing the bottles down the toilets. To try to prevent any problems at Senior Prom on May 28, students were split by gender and searched by administrators as they boarded the buses following the Grand March in the school gym. At prom, chaperones were stationed in the bathrooms and a police detail (always present at schools dances anyway) was stationed near the entrance to the ballroom. There were also more administrators and adult chaperones at Senior Prom than have attended in previous years. “We had a dean present. We also increased the bathroom circulation. [It has been rumored that] the problems that happened at the [Junior] prom began on the bus. In hindsight, we should have implemented what we did at senior prom,” he said. Cron feels the student body is made up of three groups: those who don’t want to drink at dances, those who feel the need to in order to have fun, and those who are in the middle and unsure of the choice they want to make. He then said his goal is for those in the middle to know it’s fine to go to a dance and have fun without drinking. “I finally figured out the reason I was so upset though it took me 48 hours to figure out what bothered me the most,” he said. Cron was most disappointed in the status of the school’s reputation after the incident, and the fact the classmates that had nothing to do with it are now facing consequences. “It was the 99% of the kids who have nothing to do with it whose reputations [were damaged],” he said. The larger problem Cron is hoping will not become worse is the idea of teen drinking in general. While it has been specifically a problem at dances, it causes more of a concern on a larger scale outside of school. “It’s a problem absolutely. It’s dangerous. I heard a startling statistic: a student that has their first drink at 14 is 60% more likely to develop a drinking problem. People who take their first drink at 21 are 6-8% more likely to form a drinking problem,” Cron said. Cron said despite what happened at the Junior Prom, his trust level and admiration for the students in the class and at Rockland High hasn’t changed. “I like you guys. I trust you guys to be your age. I am constantly amazed by some of the things kids do that don’t show their age but show their character and who they are. [The juniors] are some of the most kind, young and generous people I will ever meet,” he said. Cron said that next year, searches and random breathalyzing, as well as increased chaperone presence, will continue at all dances. “I think it’s a good idea to do a pat down coming into a dance. I think it’s a good idea to randomly breathalyze on the way out of the dance so nobody gets into a car with someone who has been drinking,” Cron said. Students in the classes of 2015 and 2016 will be voting Wednesday to decide if there will be a joint junior-senior prom next year. Cron said the idea came up prior to the incidents at the prom and would be to save money, not punish students. If students vote against it, Cron said two separate proms will go forward, and he has no plans to hold one in the gym as was rumored. Each of RHS’ academic departments recognized their Academic Achievers in grades 9-11. Receiving Overall Outstanding Academic Achiever Awards were Alyssa Collins, grade 11, Ryan Sugrue, grade 10, and Luana Lima, grade 9. Junior Danielle Hill received several awards at the banquet including a Silver Key for Drawing from the Globe Scholastic Art Show. Danielle was also recognized for being selected to Art All-State and for her participation in the State Finals of the Poetry Out Loud Contest. She also performed one of her poems from the competition. Sophomore Ashley Pezzella was recognized as a first place winner in the Patriotic Art Show of Massachusetts sponsored by the Ladies Auxiliary of the Veterans of Foreign Wars. Her drawing will now be entered in the Nationals. For more details on all the award winners scroll through our photo gallery. Superintendent John Retchless and Guidance Director Melanie Shaw presented junior Alyssa Collins with the Overall Outstanding Academic Achiever Award for Grade 11. Assistant Principal Sue Patton & Principal Alan Cron presented junior Alyssa Collins with the Rensselaer Award for Math & Science. Shawn Ward & Hannah Millen received the Grade 9 Art Achievement Award. Celia Rosa holding the Grade 10 Art Achievement Award presented to her by Art Department Director, Sandra Gibson. Juniors Danielle Hill and Hailey Smith holding their Grade 11 Art Achievement Awards. Ashley Pezzella was the Patriotic Art Show of Massachusetts, first place winner. Her drawing pictured above will now be entered in the Nationals. Her award was presented by Melissa Pratt, and Claire Payne of the Ladies Auxiliary Veterans of Foreign Wars (LAVFW). Left to right are juniors Nicole Cook, Dennis McPeck, Eddie Yeadon, Kara Penney who have been selected to represent RHS at Boys and Girls State. Sophomore Kaleigh Pishkin holding the Family Consumer Science Award for Grade 10, presented by Mrs. Fleming. Freshmen Isabelle Pica and Meghan Saucier holding the Family Consumer Science Award for Grade 9 presented by teacher Trish Fleming. Danielle Hill received several awards at the Academic Awards Banquet including a Silver Key for Drawing from the Globe Scholastic Art Show, Honorable Mention from the Second Parish Church of Hingham Art Show, and First Place Drawing from the Congressional Art Show. Danielle was also recognized for being selected to Art All-State and for her participation in the State Finals of the Poetry Out Loud Contest. Assistant Principal Susan Patton presented Danielle with her awards and recognition certificates. Sophomore Ella Engle was a Multi-Award Winner in English and Music. Her plaque was presented by Assistant Principal Susan Patton. Juniors Alex Pigeon and Pearse McNally received the English Academic Achiever Award, presented by English teacher, Amy Woodward. Freshmen Julio DiCienzo and Sydney Wells received the English Department’s Academic Achievement Award, presented by English teacher, Amy Woodward. Assistant Principal Susan Patton presented freshman Evan Murphy with his Academic Achievement Award for Social Studies and Physical Education. Junior Iman Bendarkawi was presented an award for Foreign Language by Mr. Moscoso. Sophomores Matthew Kirslis and Erika Wiley received a Foreign Language Award from Mr. Moscoso. Freshmen Yousra Bendarkawi and Sean Vo received their Foreign Language Achievement Awards from Spanish teacher, Jorge Moscoso. Freshman Genesis Rojas received an academic achievement award in music from Music Department Director Matt Harden. Assistant Principal Patton presented sophomore Haley Macray with a Mulit-Award Winner plaque for Academic Achievement in both Art and English. Music Director Matt Harden presented junior Ian Welch with the Music Department’s Academic Achievement Award. Julia Matson received the Grade 11 Math Academic Achievement Award from math teacher Fred Damon. Juniors Kaitlyn Mott (left) and Taylor Reis received an Academic Achievement Award for Family Consumer Science from instructor Trish Fleming. Junior Kara Penney was presented the St. Michael’s College Book Award by Assistant Principal Susan Patton. Freshman Luana Lima was presented with the Overall Outstanding Academic Achiever Award by Superintendent Joh Retchless and Guidance Director Melanie Shaw. Freshman Matt Dunn received an Academic Achievement Award for Business from math teacher and Hall of Fame inductee, Fred Damon. Sophomores Michael Rocha (left) and John Yandle won Technical Education Academic Achievement Awards, presented to them by Technical Education Department Head, Brenda Folsom. Junior Benjamin McKenna was presented an Academic Achievement Award for Physical Education by Physical Education Director Brenda Folsom. Sophomore Michael Ivanoskos won an award for Physical Education from by Physical Education Director Brenda Folsom. Freshman Michael Belmonte received his Multi -Winner Award in Music and Technical Education from Assistant Principal Sue Patton. Sophomores Sara Bistany (left) and Lexie Carchedi received their Social Studies Academic AchievementAwards from Social Studies Chair Randall Grimmett. Social Studies Department Chair Randal Grimmett presented the department’s Academic Achievement Awards to juniors Brandon Hutchinson (left) and Cameron Kelley. Freshman Adam Royle received his Multi-Winner Academic Achievement Award for Health and Technical Education from Asst. Principal Sue Patton. Department Chair Brenda Folsom presented the Technical Education Achievement Awards to juniors Adam Garden (left) and Jason Cameron. Freshman Emily Delaney received an Academic Achievement Award in both Business and Social Studies presented to her by Assistant Principal Susan Patton. Juniors Kallie Morss and Madeline Daly were given their Academic Achievement Awards in Science by science teacher Jennifer Wozniak. Assistant Principal Susan Patton presented sophomore Thomas Spengler with a Multi-Winner Award for his academic achievement in both Business and Mathematics. Taylor Reis received the I Dare You Award from Assistant Principal Susan Patton. 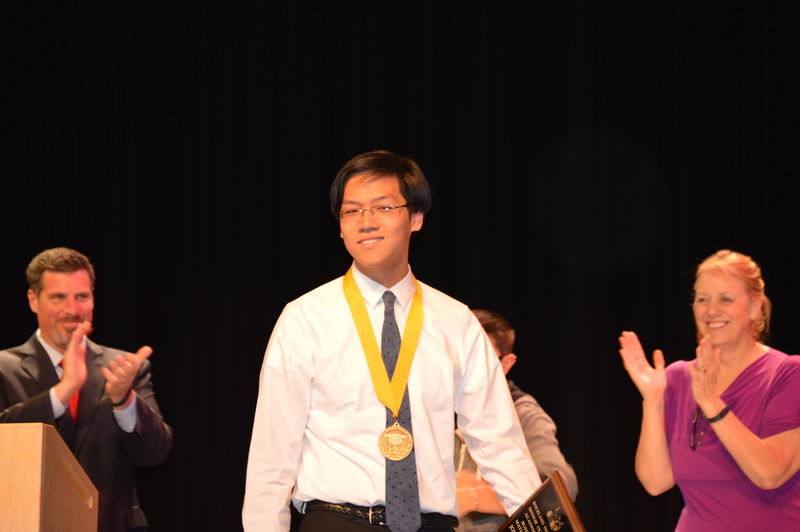 Freshmen Douglas Reardon and Vivian Nguyen received Academic Achievement Awards in Science. Science teacher Jennifer Wozniak made the presentation. Ryan Sugrue received the Overall Outstanding Academic Achiever Award from Rockland Superintendent of Schools, John Retchless and RHS Guidance Director Melanie Shaw. Sophomore Sarah Margolis was a Multi-Award Winner for Mathematics and Science. Her award was presented by Assistant Principal Susan Patton. The Senior Awards Banquet was held for the Class of 2014 in the Rockland High Auditorium on Thursday, May 29. Following a dinner in the cafeteria, students, teachers, and families saw awards and scholarships handed out, many to standing ovations from families and fellow students. Former student Brian Byrne was presented with his Rockland High School Diploma. The Valedictorian Award was given to Jonathan Soo Hoo, and the Overall Academic Achievement Award was given to Salutatorian Lauren Scott. The U.S. Marine Corps Sergeant Cody Lee presented a special award to Thomas Sweeney, who will be joining the Marine Corps following graduation. Please see the list of other awards and scholarships, as well as pictures from the event, below. Senior Academic Letters (Excellence In Education) – Leah Benson, Jacqueline Casey, Nicholas DeMarco, Kayla Frazer, Ian Haas, Paul Hanlon, Jaquelin Jordan, Matthew Martin, Erin Mulready, Georgia Panagiotidis, Victoria Pratt, and Nicole Rakoski. English teacher Chris Neal accepts a yearbook from the Class of 2014, which was dedicated to him. Valedictorian Jon Soo Hoo accepts his medal from Superintendant John Retchless. 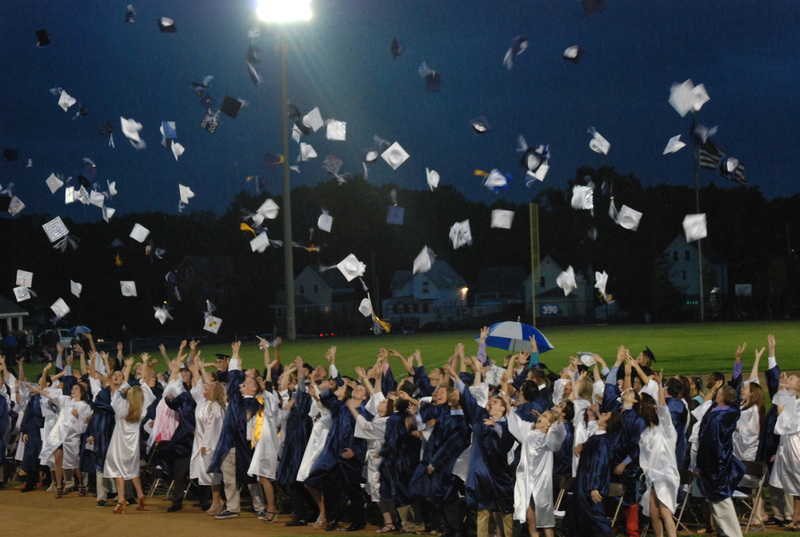 The graduation ceremony for the Class of 2014 was held in The Rockland Memorial Stadium on Friday, May 30. Speeches were made by Principal Alan Cron, Superintendent John Retchless, and student speakers, Senior Class President Molly Garrity and Valedictorian Jonathan Soo Hoo. Though rain threatened the ceremony for most of the night and fell towards the end, graduates were elated to hear the scholarships they received and their names called as they received their diplomas.